REVELATION 3:20 KJV "Behold, I stand at the door, and knock: if any man hear my voice, and open the door, I will come in to..."
17Because thou sayest, I am rich, and increased with goods, and have need of nothing; and knowest not that thou art wretched, and miserable, and poor, and blind, and naked: 18I counsel thee to buy of me gold tried in the fire, that thou mayest be rich; and white raiment, that thou mayest be clothed, and that the shame of thy nakedness do not appear; and anoint thine eyes with eyesalve, that thou mayest see. 19As many as I love, I rebuke and chasten: be zealous therefore, and repent. 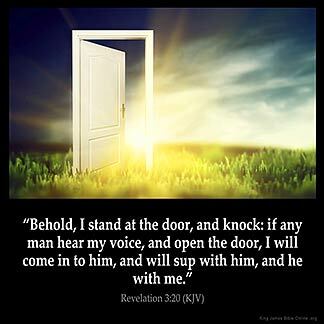 20Behold, I stand at the door, and knock: if any man hear my voice, and open the door, I will come in to him, and will sup with him, and he with me. 21To him that overcometh will I grant to sit with me in my throne, even as I also overcame, and am set down with my Father in his throne. 22He that hath an ear, let him hear what the Spirit saith unto the churches. Behold, I stand at the doore, and knocke: if any man heare my voyce, and open the doore, I will come in to him, and will sup with him, and he with me. Lo! Y stonde at the dore, and knocke; if ony man herith my voys, and openith the yate to me, Y shal entre to hym, and soupe with hym, and he with me. 3:20 I stand at the door, and knock - Even at this instant; while he is speaking this word. If any man open - Willingly receive me. I will sup with him - Refreshing him with my graces and gifts, and delighting myself in what I have given. And he with me - In life everlasting. Re 3:20 Behold, I stand at the door, and knock. The language implies that Christ is near. If they will open the door by repentance he is ready to enter and bless. If any man shall hear my voice, and open the door. Hear and obey. Then the Lord will enter, and they shall partake together of the richness of the feast. The sensitivity of recognizing the voice and the ability to open the door your heart determines the fellowship, relationship with the Lord .IT IS A CHOICE. get ready to receive Him now! surrender your heart to Jesus now!